What I Call “Pure Perfection” Fine Dining Experience! I had Tableau Bar Bistro in mind two months prior to my boyfriend’s birthday and I knew it would be the perfect timing to do some fine dining here for his special day. 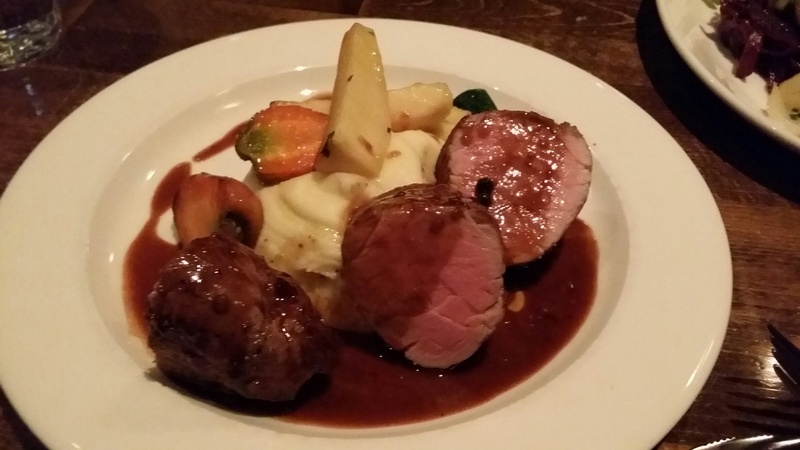 This restaurant is located in Coal Harbour and to some people, it may be a far drive. But for me personally, I do not pass by this area often so I am definitely fine with it. 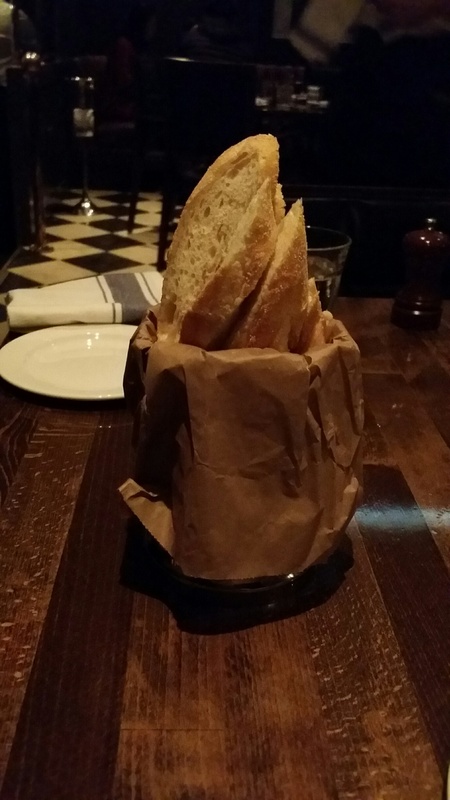 After ordering, our attentive server brought us some complimentary French sourdough bread which was very fresh. I believe I ate two slices because I was hungry at the time and I just could not get my hands off of them as they were just that good. 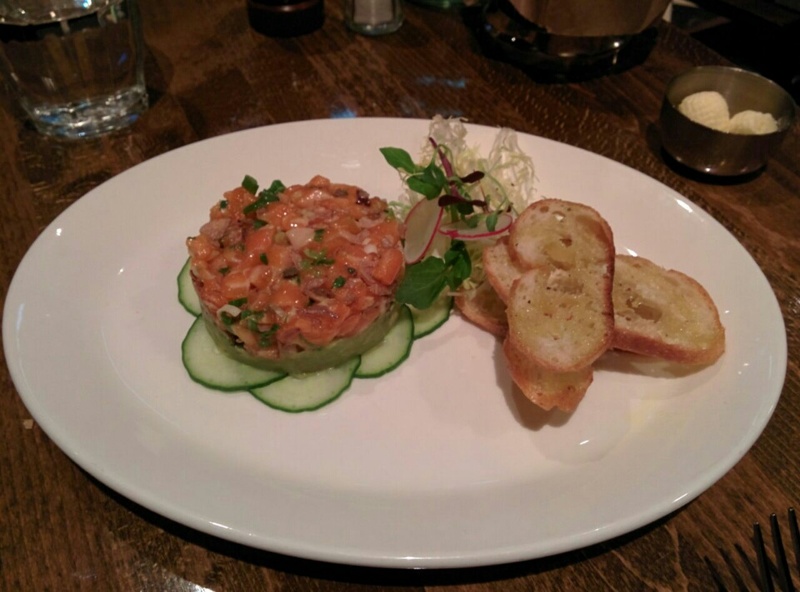 For the appetizer we shared the daily special which was the Tuna Tartare ($16). Surprisingly, this was my first time trying this. The preparation and presentation of the dish was made with perfection. The layer of marinated tuna, onions, and cilantro leaves was on top of a thinner layer of avocado. On the very bottom, there was a bedding of sliced cucumbers. The dish came with a nice complement of French baguettes. The first bite I took, the tuna melted in my mouth and I could tell it was fresh. I highly recommend this dish if they have it as a daily special. Before coming to the restaurant, I knew exactly what I wanted to order for my entrée. Yes, I did my research and I have no shame in doing so. 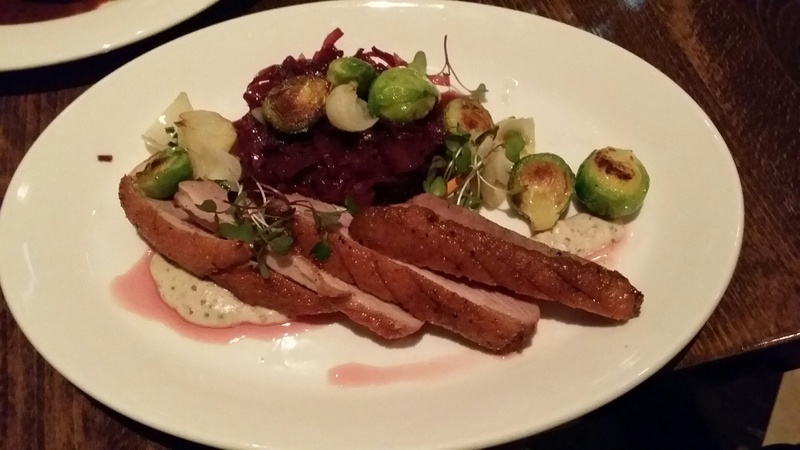 I requested for the popular Roasted Duck Breast ($25) which included soubise onion, braised cabbage, and mustard sauce. The duck breast was pan roasted to my expectations and very moist. It was full of flavor, juicy, and most importantly, very tender. For the price, I was content with my order. However, I was not very pleased with my sides as I tend to be picky with my vegetables. On the other hand, my boyfriend ordered the Pork Tenderloin ($24) as recommended by our waiter. This came with zucchinis, daikons, and mashed potatoes. He loved the pork tenderloin which was also very tender and full of flavour. The peppercorn sauce complemented the dish very well and was not too overpowering. The side of mashed potatoes was also excellent and some of the creamiest I’ve ever tried. Someday I wish I could roast just as good of a pork tenderloin at home. 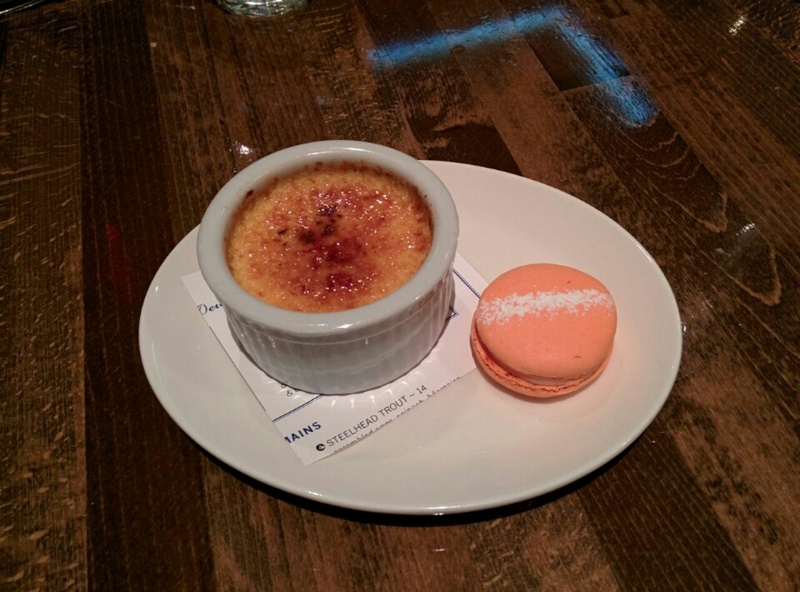 To end the meal, we ordered a Crème Brulée ($7) which came with an orange flavored macaron. How can we leave the restaurant without ordering a dessert? The crème brulée was ultra rich and smooth. I loved eating the crunchy caramelized top which I devoured within seconds. As for the macaron, I raised my eyebrow when I heard “orange” flavor. It just did not jump out at me, but the texture of the macaron was light and airy. Overall, my fine dining experience at this restaurant was over the moon. I was very pleased with the food and service. I would definitely return for lunch or dinner in the near future. It is definitely an affordable restaurant to hit up for a special occasion or even just a weekend. I am feeling so ecstatic right now, one restaurant crossed off my food list, many more to come. What an amazing start to 2015! What are some of your 2015 food dining wishes?